Some people interpret agile research as fast and cheap. Insights professionals know it must be better than that. Yes, it must be fast enough to work within tight, agile time frames; and cost effective to be conducted for multiple iterations, but the research can’t be managed in a way that the results aren’t reliable. There is no value in completing research quickly if it fails to deliver valid findings! Agile management processes require a different approach to research and analysis, exemplified by this case in which an auto insurance company insights team works to improve the online application process after receiving numerous complaints. The insights and business teams worked seamlessly together, successfully implementing an agile approach to improvements, because they were aligned from the start on the goals and success metrics of the research. To understand Agile, you need to first consider project management processes for traditional product development. The traditional or waterfall process relies on a linear method based on stage gates such as Idea to Concept to Business Case to Development to Testing to Launch. Customer insight is sought at established points in time. Software developers were frustrated with this approach as it took too long to develop innovative products and once they did; they often couldn’t keep up with customer needs. As agile processes have become the norm for software companies like Apple and IBM; non-software companies like AT&T, Phillips, and John Deere have begun to adopt the processes. Agile project management is based on an iterative product development life cycle – where every project is managed collaboratively and in small parts. Agile project management is a based on an iterative product development life cycle – where every project is managed collaboratively and in small parts to reduce friction and keep moving in the right direction. Unlike traditional methods, the product doesn’t need to be perfect before its launched. Instead, you launch a “minimally viable product” – one that provides a value to the customer. Then, you make continuous product iterations based on customer feedback with every iteration. Agile is a particularly useful methodology where products will be developed to solve complex problems and in rapidly changing marketplace environments. Agile seeks to help organizations make better decisions and solve issues more effectively with less wasted time and resources. Roll out and test; roll out and test; roll out and test; etc. Here’s a case study that exemplifies how an insights team works within an Agile environment. An auto insurance company wanted to improve their online customer application process. Customers had been complaining that it was taking too long to get their online application approved and internally, they knew that their processes were inefficient. The team planned to use Agile management processes and they sought the advice of the Insights Team for customer input. The Insights Team used the DecisionAdvancer Smart Insights Brief with the Application Team to get clarity on the current situation as well as their goals and expectations for customer input. They worked with the Application team to define the problem and to document the backlog list of challenges and improvements associated with application process based on previous input from customers, sales agents, and customer service reps. They also documented success metrics to identify ways to improve the insights development process in the future and how the insights research and analysis impacted the new application process. The teams prioritized the elements on which to work and mapped out the process in ‘sprints’ (e.g. two-week planning cycles). Once a research sprint was completed the insights are fed into a development sprint (for the MVP), and the next research sprint takes place. This continued until the goals were accomplished. However, “agile marketing research” should not mean conducting the research so quickly and cheaply that its not reliable. You want to learn from product iterations that “fail fast,” not from “fast failing” research! (Read the NewMR blog post for more on this). 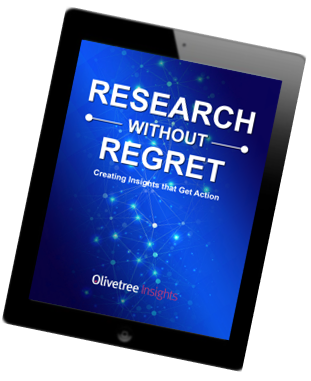 “Agile marketing research” should not mean conducting the research so quickly and cheaply that its not reliable. The insights team established an online community of customers to conduct research during the sprint periods. Depending on the issue they needed to explore, they sometimes used video chats to speak one-on-one with the panelists, sometimes used a discussion board format; and sometimes they used short surveys. The analytical team was also quite involved, as often the team needed internal data to feed decisions. Each research sprint yielded new insights to build on the former ones. The insights team kept their Application team members up-to-date and aligned on the study objectives and methodology for each sprint using the DecisionAdvancer platform. Because the goals and expectations were so clearly aligned from the start, the Insights and Application teams worked seamlessly together and so the process was frictionless. The Insights Team was able to guide the Application Team to make the optimal customer-based decisions. The redesigned customer application process resulted in more online applications and fewer customer service rep time. Because success measures were identified in the initial planning stage and careful track was kept of how learnings informed decisions, both the Application Team and the Insights Department were able to measure the ROI of their research investment. As a bonus, they identified new ways to improve the insights process for future projects. This Insights Team was up to the Application improvement challenge. They knew they could rely on DecisionAdvancer’s Smart Insights Brief to keep the teams focused on the right problems and opportunities from the very beginning of the project. The Insights Team confidently delivered actionable insights that were properly aligned with organizational objectives. The Application team was appreciative of a process that resulted in an improved, customer-centric application using Agile management. The auto insurance company was assured that their research resources had been used wisely.